I was contacted recently to try out a new cleat. For the first time in a couple years I would be trying out something new, something that wasn’t well known. The boot was different, the lacing was unique and the fit was natural. The boot was a new shoe from a company called Concave. Their cleats or boots are now worldwide including in the English Premier League. First of all I must say I am picky when it comes to anything shoe related. Most that know me know that I am a laid back person who typically wears flip-flops on a daily basis, even in winter. So picking a soccer cleat is always a tough thing for me because it has to fit just right and not totally make my feet feel closed in. 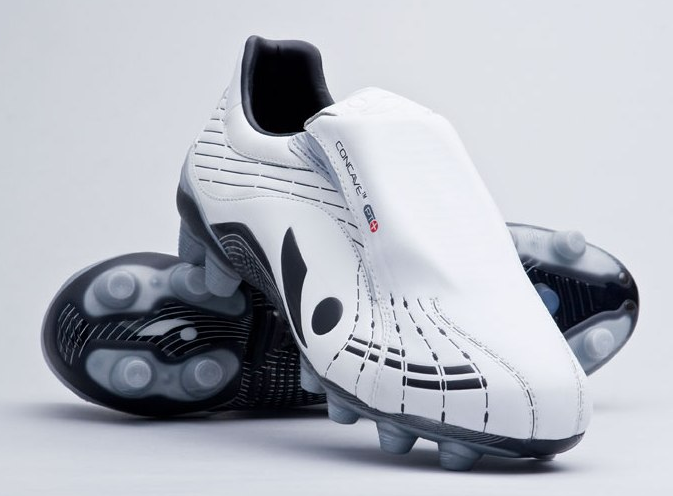 Upon trying the Concave Soccer Boot I was shocked at the fit, it was like no cleat I had ever tried before. The unique lacing was so different but yet so right I couldn’t take them off. My feet felt free and kicking the ball seemed as natural as ever. Giving the boot a try in a pickup game also was good. In all I can say these new boots are something else. Normally I am a Kelme or adidas guy when it comes to cleats but I may start being a Concave guy. If you get the chance to use these boots I highly recommend it. I hope to soon post some photos of these boots in action. Maybe this spring once the weather turns around I will.